SMITHS FALLS, Ontario – A couple held hostage for five years by a Taliban-linked extremist network in Afghanistan was safely back in Canada on Saturday after what the husband described as a harrowing firefight during a raid to free the family. 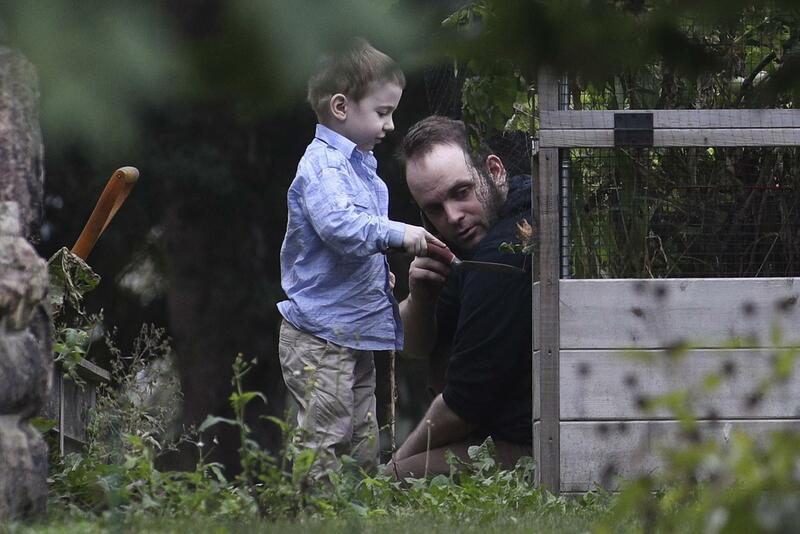 Joshua Boyle played with one of his sons in the garden of his parents’ home. The boy appeared happy and healthy, digging in the grass as his father showed off the different plants and later spoke on a cellphone. In a video released by Pakistan’s military that was filmed before he left that country for home, Boyle said Pakistani security forces positioned themselves between the hostages and their Haqqani network captors to keep the family safe amid the gunfire. “A major comes over to me while I still have blood on me. The street is chaos and he says to me, ‘In the American media they said that we support the Haqqani network and that we make it possible. Today you have seen the truth. Did we not put bullets in those bastards?’” Boyle recalled, appearing beside his wife and children in the video. Boyle, his American wife, Caitlan Coleman, and their three children were rescued Wednesday, five years after the couple was abducted in Afghanistan while on a backpacking trip. Boyle said the kids, who were born in captivity, were adjusting to a new reality after growing up amid a group of “pagan” bandits. “These are children who three days ago they did know what a toilet looks like. They used a bucket,” Boyle said in the video. “Three days ago they did not know what a light is or what a door is except that it is a metal thing that is locked in their face to make them a prisoner. Coleman was pregnant at the time of their abduction and ultimately gave birth to four children while in captivity. Boyle said after landing at Toronto’s airport that the extremists killed their newborn daughter and raped his wife during the years they were held. Pakistan’s Foreign Ministry spokesman, Nafees Zakaria, said the rescue raid was based on a tip from U.S. intelligence and shows that Pakistan will act against a “common enemy” when Washington shares information. He also emailed to AP two photos of his son Najaeshi Jonah Makepeace Boyle and said the boy began “raiding the first refrigerator of his life.” The picture shows the boy sitting on the floor in a dark corner with food in his hand. The other shows him napping with a blanket covering part of his face and surrounded by stuffed animals. A U.S. national security official, who was not authorized to discuss operational details of the release and spoke on condition of anonymity, said the U.S. obtained actionable information, passed it to Pakistani officials, asked them to interdict and recover the hostages – and they did. The operation appears to have unfolded quickly and ended with the raid, the shootout and a captor’s final, terrifying threat to “kill the hostage.” Boyle told his parents that he, his wife and their children were intercepted by Pakistani forces while being transported in the back or trunk of their captors’ car and that some of his captors were killed. He suffered only a shrapnel wound, his family said. Published: Oct. 14, 2017, 4:27 p.m.